On Tuesday 23rd April 2019 the sun will rise at 06:00 and will set at 20:20. It will be a mild day, with temperatures reaching around 20.2°C. A few showers are expected, 3mm of rainfall is possible today. There will be a gentle breeze in the air today, with a maximum expected wind speed of 13mph. On Wednesday 24th April 2019 the sun will rise at 05:58 and will set at 20:21. It will be a mild day, with temperatures reaching around 12.8°C. A few showers are expected, 3mm of rainfall is possible today. There could be quite a strong breeze in the air today, with a maximum expected wind speed of 31mph. On Thursday 25th April 2019 the sun will rise at 05:56 and will set at 20:23. It will be a mild day, with temperatures reaching around 12°C. A few showers are expected, 3mm of rainfall is possible today. It could be quite a gusty day today, with a maximum expected wind speed of 27mph. On Friday 26th April 2019 the sun will rise at 05:54 and will set at 20:25. It will be a mild day, with temperatures reaching around 11.2°C. Some moderate to heavy rain is expected, 9mm of rainfall is possible today. It could be quite a gusty day today, with a maximum expected wind speed of 35mph. On Saturday 27th April 2019 the sun will rise at 05:52 and will set at 20:26. It will be a mild day, with temperatures reaching around 9.7°C. Today is expected to be a dry day, with a very low chance of rain. It could be quite a gusty day today, with a maximum expected wind speed of 33mph. On Sunday 28th April 2019 the sun will rise at 05:50 and will set at 20:28. It will be a mild day, with temperatures reaching around 12.6°C. A light shower is possible, 1mm of rainfall is possible today. There could be quite a strong breeze in the air today, with a maximum expected wind speed of 30mph. On Monday 29th April 2019 the sun will rise at 05:48 and will set at 20:30. It will be a mild day, with temperatures reaching around 8°C. Today is expected to be a dry day, with a very low chance of rain. There will be a gentle breeze in the air today, with a maximum expected wind speed of 15mph. Quality accommodation in beautiful Georgian house. tel 01761 479645 close to Bath city centre, Priston Mill and major Somerset-Wiltshire attractions such as Longleat, Wells and Glastonbury. 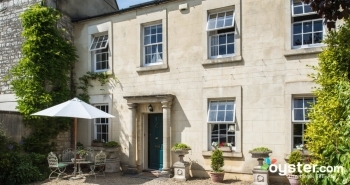 The house is just south of the City of Bath, nestled in the pretty Cam Valley. We offer private off road parking, and when it is warm and sunny breakfast can be served in the pretty secluded garden.